I read in the news here about a new documentary which tells the story of more than 900 boys who were saved from the Nazis in the Buchenwald concentration camp. Four of them recently returned to the former Buchenwald camp to star in the documentary. In the last desperate months of the Third Reich, the Nazis targeted Jewish children, who arrived at the Buchenwald death camp by the thousands. But the children had secret allies: a resistance movement of prisoners who vowed to protect them. Led by Antonin Kalina, a Czech communist, and Gustav Schiller, a Polish Jew, the underground resistance safeguarded more than 900 boys until the war was over. This documentary profiles four former prisoners of Block 66 who return to the camp 65 years after they were freed to honor the memory of their friends and protectors. So the Nazis waited until the “last desperate months of the Third Reich” to target the Jewish children? The Nazis sent Jewish children to Buchenwald to be killed? Wait a minute! Buchenwald didn’t have a gas chamber! Why bring children from Auschwitz, which had gas chambers, to Buchenwald which had no gas chamber? Fortunately, there were Communists at Buchenwald who organized an “underground resistance” to save “more than 900 boys” in the camp. Were the Nazis powerless to stop the Communists from organizing a resistance movement? Why didn’t the Nazis just kill the Communists? Then they could have killed Jewish children at Buchenwald without any interference. What about the little Jewish girls? Where were they taken to be killed in “the last desperate months of the Third Reich”? Most of the little girls stayed with their mothers in the Auschwitz camp, while the young boys, including Elie Wiesel, joined the march out of the camp and were taken to Buchenwald or other camps in Germany. You can see photos of the children who stayed in the Auschwitz camp on my website here. There is a preview of the film Kinderblock 66 on YouTube. At 2:40 in the film, these words are on the screen: “The Little Camp” was the death zone of the Buchenwald Concentration Camp.” I thought that in-coming prisoners were put into “The Little Camp” because it was the quarantine section where new prisoners were kept in attempt to prevent the spread of disease in the camp. I didn’t know that “The Little Camp” was the “death zone” where prisoners were brought to be killed. But it gets worse. At 3:21 in the documentary, these words are on the screen: “As the Nazis faced defeat the number of Jews sent on death marches increased.” The implication is that “death marches” were a means of killing Jews in the last days of the war. The Nazis simply marched the Jews from one camp to another as a means of killing them. What an inefficient way to accomplish a genocide! As we all know, the Nazis had a plan to kill all the Jews. That’s what genocide means. But they fooled around and didn’t get their plan accomplished before they started losing the war, so in the final days, they had to resort to marching the Jews to death. What about the 904 orphans in Block 66 at Buchenwald? Forget them! Most of the orphans in Block 66 were teen-agers; only 30 of them were under the age of 13. 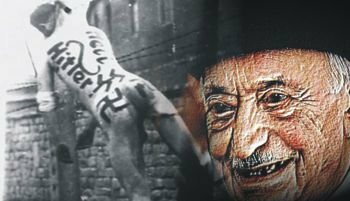 Only Yisrael Meir Lau, who was sent to Buchenwald at the age of 5 and liberated from the camp at the age of 8, was a child prisoner at Buchenwald, by his own account. Yisrael Meir Lau claims that he was tattooed with the number 117030 when he entered Buchewald. …. leading the march on Zmievskaya Balka was Israel’s Chief Rabbi Israel Meir Lau—the most unlikely survivor of Hitler’s “final solution.” Rabbi Lau was a five years old when he outwitted the Nazis and became an inmate in Buchenwald, where there were no children, and survived in defiance of all odds to become Israel’s chief rabbi. “In one of the rooms where Jews were tortured in Buchenwald,” recalled Rabbi Lau, “a Jew scraped the word ‘revenge’ into the wall. What does it mean? Are we going to fight? Will we wage war? Our revenge is to live and follow the Jewish traditions and to give birth to Jewish people. ” Rabbi Lau recited the kaddish at the memorial site, and the Kel Maleh Rachamim prayer. On Friday, Rabbi Lau visited the burial place of Feodore Mikhailichenko and offered a prayer over the grave of the non-Jewish prisoner who took little Lulek, as Rabbi Lau was called, under his guardianship in Buchenwald, and saved his life. Another news article about the march led by Rabbi Lau at Rostov-On-Don, Russia disputes the story that Jews were killed by the Nazis at this location in August 1942. Could this be another one of those “events that never happened, but are true”? “At Buchenwald, the gold watch Mama had given (my brother) Tulek was used to bribe one of the German wardens to ignore my presence. A Czech doctor saved my life by injecting me with only a half-dose of the vaccination he gave to all the men. Through a series of miracles and with the help of many good people, I passed through all the selektzias (selections). “Often, when I think of the war, I feel amazed when I contemplate the chain of miracles that happened to me. “After the injections, we were taken to a tunnel equipped with a row of showerheads. By 1945, everybody knew what to expect from showerheads in a Nazi camp, and we prepared to die a miserable death. One of the men in our group suddenly fell down dead. Ever since we left the Piotrkow ghetto, he’d been keeping a cyanide capsule hidden under a temporary filling in his tooth, and he’d decided this was the moment to use it. But the showerheads were turned on, and ice cold water sprayed out. I don’t know how to describe the life-giving warmth we felt from that icy water. “Next, we were given our prison uniforms and had our numbers tattooed on our arms. Naftali (Tulek) was number 117029; I was number 117030. Then we entered Block 52. I took the photo above, of the former disinfection building at Buchenwald, when I visited the Memorial Site in 1999. This building was built in 1942; it was converted into an art museum in 1990. When the Buchenwald camp was in operation, prisoners were taken to the disinfection building, shown above, upon arrival. The procedure was to shave the new prisoner’s head and all his body hair in an attempt to control lice which spreads typhus. Then his civilian clothing would be surrendered and disinfected with Zyklon-B, an insecticide which was also used for gassing the Jews. The clothing and personal possessions of the in-coming prisoners were then kept in the nearby storehouse until such time as the prisoner would be released. After that, the prisoner would be dipped into a disinfection solution and then chased naked through an underground tunnel to the neighboring storehouse where he would receive a striped blue and gray uniform that looked like a pair of pajamas. According to Israel Meir Lau, the tunnel had shower heads where the prisoners took a shower on their way to the storehouse. No orphan’s block for Meir Lau. He was in Block 8 where he was saved by a Russian prisoner who was not Jewish. Perhaps he didn’t know that there were 904 orphans in Block 66. After the war, the orphans were sent to France. Little 8-year-old Meir Lau went straight to Israel. However, Israel Meir Lau did mention that he knew that Elie Wiesel was in Buchenwald. Did Elie advise him never to show his tattoo? Did he learn from Elie Wiesel that “some things never happened, but are true”? Strange as it may seem, there were pregnant women at the Auschwitz II death camp, aka Birkenau, who managed to escape the gas chambers and survive. From the moment that the Jews arrived at Auschwitz-Birkenau, they were separated into two long lines, one line for men and the other line for women and small children. Anyone younger than 15 or older than 45 was immediately sent to one of the four gas chambers. Those who were allowed to live were put into one of several camps enclosed by barbed wire — the men in the Men’s Camp and the women in the Women’s camp. 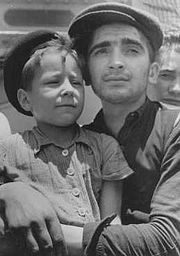 There was a separate camp for Gypsies and a “family camp” for Czech prisoners who had been transferred to Auschwitz from the Theresienstadt camp. Being pregnant in a “death camp” was a death sentence. Gisella Perl, a famous Jewish prisoner who worked as a doctor at Auschwitz, performed many abortions in order to save the lives of the women who were pregnant; if the pregnancy had been discovered by the SS men, the pregnant woman would have been beaten to death or sent to the gas chamber. Miriam Rosenthal was one of the few women who was pregnant at Auschwitz, but survived. Miriam’s life was saved because she didn’t step forward when the SS men tried to find out which women were pregnant by offering them double rations. There were 200 women who stepped forward to receive extra food, including some that were not pregnant. Miriam was too smart to fall for that trick. She survived, but the 200 other women were taken immediately to the gas chamber. I previously blogged here and here about the seven Jewish women, including Miriam Rosenthal, who were brought to Dachau after their babies were born in a Dachau sub-camp. Miriam is still alive at the age of 90 and her 67-year-old son, who was saved because his mother was smart enough to outwit the Nazis, is also alive and well. Shown from left to right in the photo above are Iboyla Kovacs with her daughter Agnes; Suri Hirsch with her son Yossi; Eva Schwartz with her daughter Maria; Magda with her daughter; Boeszi Legmann with her son Gyuri; Dora Loewy and her daughter Szuszi; and Miriam Schwarcz Rosenthal with her son Laci (Leslie). Miriam was the last of the seven mothers to give birth at Kaufering. Miriam was one of the 14 children of Jeno and Laura Schwarcz of Komarno, Czechoslovakia. After Czechoslovakia was jointly invaded by Germany, Hungary and Poland in 1938, the section of Czechoslovakia where the Schwarcz family lived was taken over by Hungary. On April 5, 1944, Marian was married to William Rosenthal, and two weeks later, she became separated from her husband when she was sent to a ghetto. Miriam was deported to Auschwitz-Birkenau, along with her husband’s family, in the middle of May 1944. Miriam survived the first selection for the gas chamber upon her arrival at Birkenau and was assigned to the women’s barracks where, after several weeks, she realized she was pregnant. In order to get out of Birkenau, she volunteered for a transport to the Plaszow concentration camp in Krakow. After only a few weeks of working at Plaszow, the camp that is shown in the movie Schindler’s List, she was sent back to Auschwitz-Birkeanu. Upon her arrival at Birkenau, Miriam survived another selection for the gas chamber, although she was obviously pregnant. Miriam was soon transferred again, this time to a sub-camp of Dachau in Augsburg, Germany where she was assigned to work in a Messerschmitt airplane factory. One day in December 1944, while at work in the factory, two SS men saw that she was pregnant; they escorted her on a passenger train to one of the Kaufering sub-camps of Dachau near Landsberg am Lech, where she was placed in a barrack with six other pregnant women who would soon be ready to give birth. 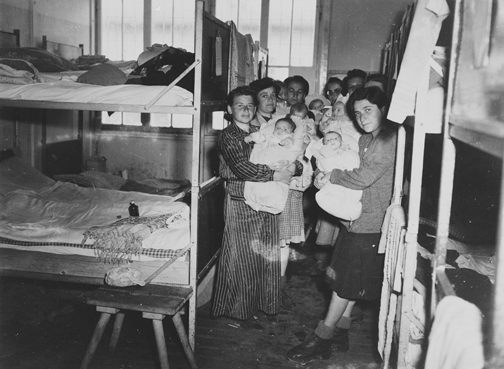 Even though they were pregnant, the women were forced to work in the camp laundry. In February 1945, the women at Kaufering started to give birth. A Hungarian Jewish gynecologist was assigned to help them through, even though he was too weak to stand. A Jewish Kapo working in the kitchen had kept the women alive during their pregnancy by sneaking them extra rations. Miriam’s baby was born on February 28, 1945, according to her story. You can read the story, as told by Miriam here. I previously blogged here about how ordinary German soldiers killed Jewish babies. The deathbed confession of Mauthausen Commandant Franz Ziereis — who was taking notes? At the Nuremberg International Military Tribunal, where the German war criminals were put on trial, there was evidence given in an affidavit made by Hans Marsalek, a former prisoner in the Mauthausen Camp. Marsalek was allegedly present when Franz Ziereis, the Commandant of Mauthausen, gave his deathbed confession. 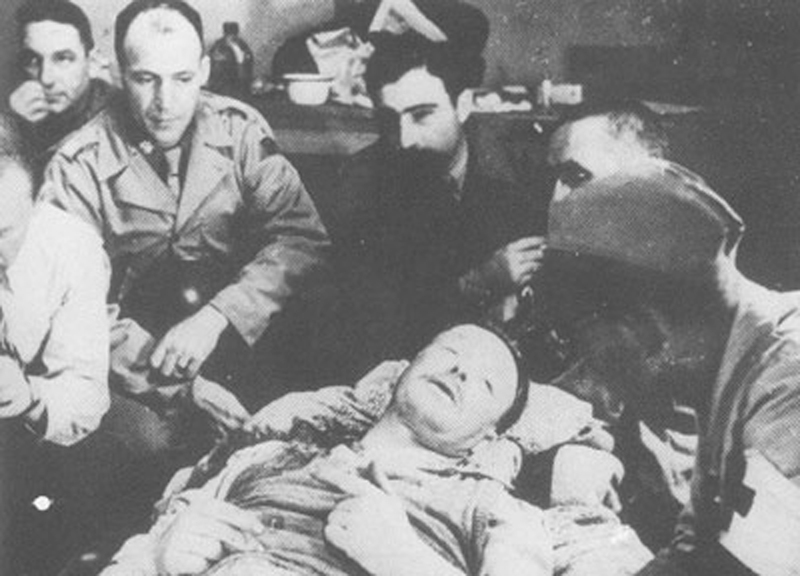 Several photos of Ziereis, on his deathbed, were taken. One of these photos, which now hangs in the Mauthausen Memorial Site Museum, shows the arm and hand of someone who was taking notes. Does anyone know the name of the person who took notes as Ziereis was speaking? Someone had to be taking notes, as Ziereis gave his 6-8 hour confession in German while Charles Heinz Pilarski translated his words into English. I have recently learned the name of an American soldier who was allegedly taking notes in English while Pilarski was translating, but I am not at liberty to divulge his name. He was allowed to bring his rough draft of the Ziereis confession home with him. Franz Ziereis was allegedly alive when the photo above was taken on May 24, 1945, the day that he died. This photo was NOT taken by an American Army Signal Corp photographer because it does not have the identification number that is characteristic of all Signal Corp photos. Note the arm and hand in the upper left hand corner of the photo. The developing and printing of the arm looks different than the rest of the photo. The developing and printing of the main part of the photo looks a bit “muddy” meaning that it does not have enough contrast, while the portion of the photo that shows the arm and the sleeve has been developed and printed correctly. This indicates to me that two different photos might have been pasted together. Note the man in the foreground of the photo above; he is wearing an American Army cap and glasses. He is also in the photo below, which appears to have been taken around the same time. Where is Hans Marsalek in the photo above? Where is the man who was taking notes? Where is the former prisoner who was translating the words of Ziereis into English? Anyone who can identify the men in the photo, please write a comment. By my calculation, there are seven men in the photo above, gathered around the deathbed of Franz Ziereis. But where is the guy who is taking notes? Where is the American soldier who allegedly took notes while Charles Heinz Pilarski was translating? On the morning of 3 May, Franz Ziereis, commander of the concentration camp Mauthausen and in this capacity also commander of the camp Gusen, left Mauthausen to hide from the allied troops in his hunting lodge in Spital am Phyrn together with his wife Ida and their three children. Almost three weeks later, on 23 May, he was apprehended by a patrol unit of the US army accompanied by former prisoners and shot when attempting to escape. Ziereis was seriously wounded and taken to the American 131st Evacuation Hospital in the former SS barracks at Gusen, where he was interrogated for several hours by members of the US army, including commander Richard R. Seibel who was responsible for camp Mauthausen, and several former prisoners. On the evening of the 24 May 1945, Ziereis died from his injuries in the military hospital in Gusen. The original interrogation document was handed over to Colonel Seibel and served as evidence in the forthcoming war crimes trials. Further records were drawn up by former prisoners who had attended the interrogation session. As a result, several versions were in circulation, which were, however, largely identical in content. The plans to hold a trial of the German war criminals, associated with Mauthausen, had already been made, even before the Mauthausen camp was liberated. Col. Richard R. Seibel, who was one of the men present at the death bed of Ziereis, had already taken over the Mauthausen camp in April 1945; he was at the camp for 35 days which included the day that Ziereis allegedly gave his confession. So why didn’t Col. Seibel testify at Nuremberg? Why didn’t he sign the alleged confession of Ziereis which was submitted in an affidavit by Hans Marsalek? I have written about the trial of the Mauthausen SS men at the American Military Tribunal here. I also wrote about the death statistics for Mauthausen and Gusen on my website here. Herbert Stolpmann, one of the readers of my blog, posted a comment in which he quoted from an article on a website which you can read in full here. The home page of the website is here. Herb has his own blog, which you can follow here. The website, from which Herb quoted, seems to corroborate what I wrote on my website about the desecration of the body of Franz Ziereiss. Polish and Russian former inmates of the camp took Ziereis’s body. 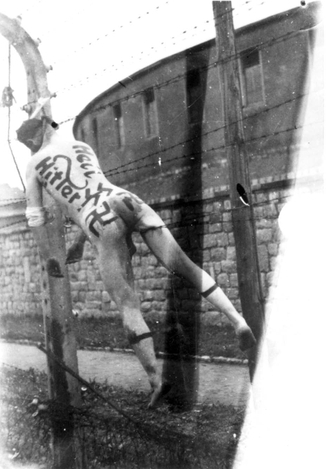 Later his body was found (and photographed) placed onto the barbed wire fence at Mauthausen, naked except for the bandage on his left arm and with his back painted with anti-Nazi graffiti “Heil Hitler” and Swastikas. This was certainly against US Army regulations, and was most likely done by angry former prisoners (as stated in the above referenced log entries) but after what the American soldiers had seen they probably felt no need to interfere with the prisoners. There Ziereis remained for several days until the stench of decay prompted an Army officer to order the body removed. Of course, there is the possibility that the company7.com website got the above information from my scrapbookpages website or from my blog. As far as I know, I am the only person to show a photograph of the body of Franz Ziereis and claim that the body was hung on a fence in the main camp. The official version of the death of Ziereis is that he died in a hospital in Gusen and his body was hung on the fence at Gusen by the prisoners and left there for a couple of weeks. However, Donald Leake saw the body of Ziereis hanging on a fence in the Mauthausen main camp after his death. The Doctor said I could leave, and someone would take care of the body. I wasn’t comfortable with this so I sent someone to my squad leader and he said to leave for other duties. I don’t know how, but I later saw his body hanging on the fence with swastikas painted all over him. What else the prisoners did, I didn’t see, but after a few days the odor was bad. I told an officer it was growing rank and he said he would take care of it which he did. Some history revisionists claim Ziereis made no statement and was dead when the photos were taken, or that he never was taken to a hospital, but these theories simply defy reason. The facts are corroborated not only by several photos taken of Ziereis at the hospital, showing several US Army personnel and officers alongside Ziereis, but also by numerous documents including the official log book of the US Army 131st Evac Hospital now in custody of the US National Archives. I must admit that I had to rethink my claim that Ziereis made no statement before he died after I saw the photo of the entry into a log book which is on the company7.com website. This was allegedly written by an American soldier. Note that he made many mistakes in spelling. There were 2,893 patients in this American Evacuation Hospital at Gusen when Ziereis was allegedly brought in, and they were rapidly dying. By the time that Ziereis was dead, there were 169 other patients in the hospital who had died. The most important thing that is missing from the Gusen Hospital log is the information that Ziereis was questioned for 6 to 8 hours and the names of those in attendance when he was interrogated. The most important person who participated in the interrogation of Ziereis was Hans Marsalek who made an affidavit, in which he quoted from the confession of Ziereis, from memory, ten months later. In his affidavit, Marsalek said that Col. Richard R. Seibel, the Commander of the 11th Armored Division, was there when Ziereis made his confession. Strangely, Col. Seibel refused to sign the alleged confession of Ziereis, as written by Hans Marsalek ten months later, and he also refused to testify at the Nuremberg IMT. 2. On 22 May 1945, the Commandant of the Concentration Camp Mauthausen, Franz Ziereis, was shot while escaping by American soldiers and was taken to the branch camp of Gusen. 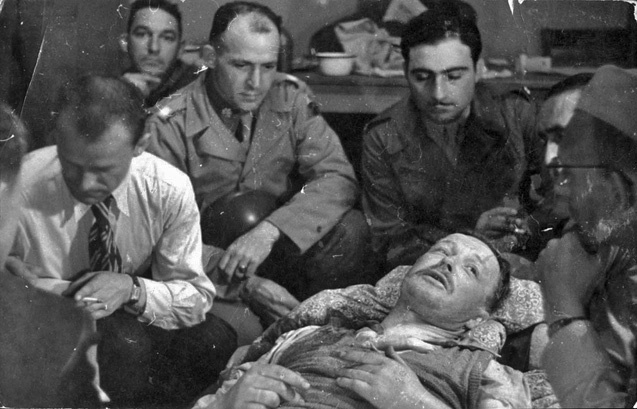 Franz Ziereis was interrogated by me in the presence of the Commander of the 11th Armored Division (American Armored Division) Seibel; the former prisoner and physician Dr. Koszeinski; and in the presence of another Polish citizen, name unknown, for a period of six to eight hours. Note that Marsalek does not mention the name of the person who translated the Confession into English for the benefit of Col. Seibel, nor does he mention the name of the person who took notes during the confession. The photographer who took photos while Ziereis was giving his lengthy confession is also not mentioned in Marsalek’s affidavit. …. allegedly Col. Richard R. Seibel, the commander of the 11th Armored Division was present when Commandant Franz Ziereis was questioned by Hans Marsalek. Col. Seibel did not testify at the Nuremberg IMT, nor did he sign his name as a witness to the confession of Ziereis. The company7.com website shows another photo of Franz Ziereis as he is giving his confession. In my opinion, this photo very clearly shows that Ziereis is dead. I have copied the photo and posted it below. Click on the photo above to see a larger version in 300 dpi. To me, this photo screams FAKE, FAKE, FAKE!!! I found another photo, which shows more clearly what is on the right side of the scene. It is an American soldier wearing glasses and a cap. Click on the photo to see a larger size in 300 dpi. Both of the eyes look like the eyes of a dead person in this photo. Note that the entry into the Gusen Hospital log book states that Ziereis was “captured” by some former Polish prisoners in the camp. This contradicts what a US soldier named Donald Leake told me in several e-mails in 2008. Donald Leake wrote in another e-mail to me that, on May 23, 1945, the U.S. soldiers at Mauthausen were alerted that there was a “disturbance” going on at a nearby village. According to Leake, several soldiers were sent to the village to take care of the problem, and Ziereis was shot 3 times in the back with a 30 cal. rifle by an American soldier with the rank of private. Leake did not witness the shooting, but he wrote that the death of Ziereis […] was of such interest to me that I asked around and found the soldier who shot him encamped with his company nearby, and asked him the circumstances of the shooting. His squad was walking toward a house where there was a disturbance and he (Ziereis) came running out, and that was when he was told to halt 3 times, then he (the soldier) fired. This discrepancy in the story of Ziereis’s “capture” leads me to believe that the Gusen Hospital Log is a fake, as is the photo allegedly taken when Ziereis was still alive. 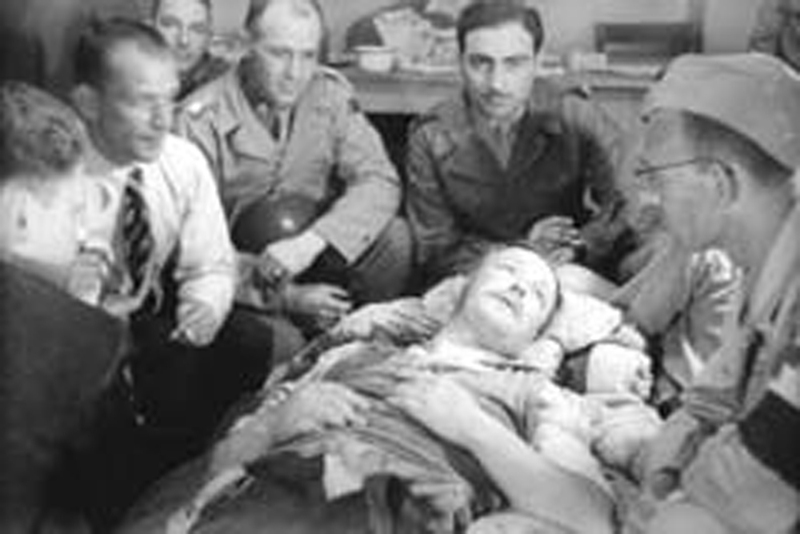 Shown below is another photo of the body of Franz Ziereis, taken by an American soldier. Sorry to have misled you with the title of my blog post. I don’t believe that there is any proof whatsoever that Franz Ziereis made a confession before he died. If there was any proof that Ziereis made a confession, why didn’t Hans Marsalek and Col. Seibel take the witness stand at Nuremberg and testify regarding the confession? The online JTA newspaper has an article about an unnamed 87-year-old World War II “war criminal,” now living in Germany, who might be put on trial in a German court in the near future. This quote is from the article which you can read in full here. 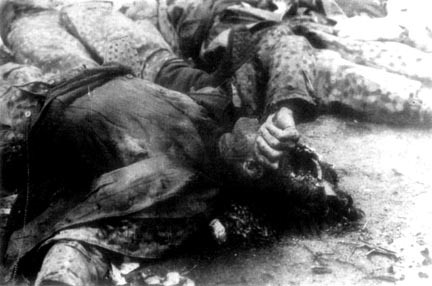 Kurt Schrimm, head of the central investigation office, told the Oberfalz.net online newspaper that the case was a direct result of the verdict against former concentration camp guard John Demjanjuk, who died in March after being convicted as an accessory to murder of nearly 29,000 Jews at the Sobibor death camp in Poland. He was sentenced to five years in prison but the case was on appeal when he died. Schrimm said the Demjanjuk case “triggered a shift in the interpretation of the law,” expressly allowing courts to go after war criminals who enabled others to commit murder. Since then, the investigative body has aggressively pursued similar cases, starting with those that look most promising, he told Oberfalz.net. The verdict against Demjanjuk created a new legal principle in Germany which will now allow German citizens who served in the military in World War II to be put on trial if they were anywhere near a location where Jews died in the Holocaust. The next man who might be put on trial in Germany is a former guard at the Auschwitz camp. You can read about Auschwitz on my website here. An investigation of the man — whose name has not yet been released by the Central Office of the State Justice Administrations for the Investigation of National Socialist Crimes — shows that he volunteered for the Waffen SS in 1942 and was trained as a guard, according to the German news agency dpa. The guard worked at the arrivals ramp and in a guard tower at Auschwitz-Birkenau, where he has been accused of contributing “significantly” to the murder of at least 344,000 people in the gas chambers in 1944. According to the report, most of the victims were Jews from Hungary. It is my purpose to open the case, particularly under Count One of the Indictment, and to deal with the Common Plan or Conspiracy to achieve ends possible only by resort to Crimes against Peace, War Crimes, and Crimes against Humanity. My emphasis will not be on individual barbarities and perversions which may have occurred independently of any central plan. One of the dangers ever present is that this Trial may be protracted by details of particular wrongs and that we will become lost in a “wilderness of single instances”. Nor will I now dwell on the activity of individual defendants except as it may contribute to exposition of the common plan. Let there be no misunderstanding about the charge of persecuting Jews. What we charge against these defendants is not those arrogances and pretensions which frequently accompany the intermingling of different peoples and which are likely, despite the honest efforts of government, to produce regrettable crimes and convulsions. It is my purpose to show a plan and design, to which all Nazis were fanatically committed, to annihilate all Jewish people. These crimes were organized and promoted by the Party leadership, executed and protected by the Nazi officials, as we shall convince you by written orders of the Secret State Police itself. The conspiracy or common plan to exterminate the Jew was so methodically and thoroughly pursued, that despite the German defeat and Nazi prostration this Nazi aim largely has succeeded. Only remnants of the European Jewish population remain in Germany, in the countries which Germany occupied, and in those which were her satellites or collaborators. Of the 9,600,000 Jews who lived in Nazi-dominated Europe, 60 percent are authoritatively estimated to have perished. Five million seven hundred thousand Jews are missing from the countries in which they formerly lived, and over 4,500,000 cannot be accounted for by the normal death rate nor by immigration; nor are they included among displaced persons. History does not record a crime ever perpetrated against so many victims or one ever carried out with such calculated cruelty. We charge that all atrocities against Jews were the manifestation and culmination of the Nazi plan to which every defendant here was a party. Determination to destroy the Jews was a binding force which at all times cemented the elements of this conspiracy. On many internal policies there were differences among the defendants. But there is not one of them who has not echoed the rallying cry of nazism: “Deutschland erwache, Juda verrecke!” (Germany awake, Jewry perish!). This Tribunal, while it is novel and experimental, is not the product of abstract speculations nor is it created to vindicate legalistic theories. This inquest represents the practical effort of four of the most mighty of nations, with the support of 17 more, to utilize international law to meet the greatest menace of our times — aggressive war. The common sense of mankind demands that law shall not stop with the punishment of petty crimes by little people. It must also reach men who possess themselves of great power and make deliberate and concerted use of it to set in motion evils which leave no home in the world untouched. It is a cause of that magnitude that the United Nations will lay before Your Honors. The “common plan” theory of guilt was never used in modern times — until the John Demjanjuk case. There was no evidence presented in court that Demjanjuk had done anything wrong, yet he was convicted of being an accessory to the killing of Jews because he was allegedly a guard at the Sobibor camp. This opens up a new charge that can now be used against every living person who was a guard at a concentration camp during World War II. In his opening statement at the Nuremberg IMT, Robert Jackson used “The Stroop Report” to show the “common plan” aspect of the German war crimes. “The resistance put up by the Jews and bandits could only be suppressed by energetic actions of our troops day and night. The Reichsführer SS ordered, therefore, on 23 April 1948, the clearing out of the ghetto with utter ruthlessness and merciless tenacity. I, therefore, decided to destroy and burn down the entire ghetto without regard to the armament factories. These factories were systematically dismantled and then burned. Jews usually left their hideouts, but frequently remained in the burning buildings and jumped out of the windows only when the heat became unbearable. They then tried to crawl with broken bones across the street into buildings which were not afire. Sometimes they changed their hideouts during the night into the ruins of burned buildings. Life in the sewers was not pleasant after the first week. Many times we could hear loud voices in the sewers. SS men or policemen climbed bravely through the manholes to capture these Jews. Sometimes they stumbled over Jewish corpses; sometimes they were shot at. Tear gas bombs were thrown into the manholes and the Jews driven out of the sewers and captured. Countless numbers of Jews were liquidated in sewers and bunkers through blasting. The longer the resistance continued the tougher became the members of the Waffen SS, Police and Wehrmacht who always discharged their duties in an exemplary manner. Frequently Jews who tried to replenish their food supplies during the night or to communicate with neighboring groups were exterminated. In today’s news, there is an article about a former Auschwitz guard who is still alive and is now in danger of being prosecuted under the concept of “common design,” an ex-post-facto legal principle that was made up by the Allies after World War II. The Allies used the “common design” or “common plan” concept to convict anyone who had any connection whatsoever to a concentration camp. The “common plan” principle was also used at the Nuremberg International Military Tribunal. I previously blogged about the Demjanjuk case in which the “common plan” law was used. I predicted that this principle would be used again to convict any German still alive who had any connection, however remote, with the Holocaust. I also blogged here about the American Military Tribunal which had a 100% conviction rate, using the “common design” principle which has no defense. Basically, under the “common design” principle, if you were there, you are guilty. For example, the Commandant of the Buchenwald camp: I blogged about his conviction here. The following quote is from the news article about the 87-year-old man who will be the next victim who is brought into a German court on a stretcher to face charges of gassing people at Auschwitz because he was a guard at Auschwitz and he did nothing to stop the gassing. His only defense will be to prove that he was not a guard at Auschwitz. Will the court have to prove that people were gassed at Auschwitz? No, of course not. That is “common knowledge” which does not have to be proved. The Baden-Württemberg Zentrale Stelle for Nazi prosecutions said its investigation into the man was completed and had been handed to the public prosecutor in Weiden, Bavaria. The man, who lives outside Germany, worked at the camp from at least April 1944, in closing off ramps leading to gas chambers, in guard duties around the camp, and in shifts on the watchtowers. This is enough to consider him having made a “causal contribution to the murderous crimes,” the Zentrale Stelle report concluded. The public prosecutor confirmed it had received files which it would take several weeks to check. Head of the Zentrale Stelle Kurt Schrimm said May’s conviction of Demjanjuk had been crucial to his continued work in putting together this prosecution case. “The verdict of Munich district court burst the dam,” he said. Before that verdict courts had required proof of individuals personally taking part in a murder to convict them. But since the conviction of Demjanjuk this is no longer the case. He was convicted of helping to murder at least 28,000 people at Sobibor death camp in Poland simply due to the fact he worked there as a guard. When will this madness stop? Never! There will never be enough Revenge against the German people. The German people have now been rehabilitated and they are participating in their own demise. Charles-Heinz Pilarski was a German citizen, who volunteered to serve in the German military in November 1937. By his own account, Pilarski was court-maritaled on February 20, 1940; he was accused of “anti-fascistic agitation among the ranks of soldiers.” After a trial, that lasted nearly four hours, he was sentenced to three years in military prison. His prison term was to start after Germany had won the war. Until that time, he was to be a prisoner in a concentration camp. Shortly before the Mauthausen concentration camp was liberated in May 1945, he was brought there as a prisoner. Ziereis fled [from the Mauthausen camp] with his wife on May 3, 1945. He attempted to hide out in his hunting lodge on the Phyrn mountain in Upper Austria. He was discovered and arrested on May 23, 1945, by an American army unit. He was shot while trying to escape and brought to a U.S. military hospital set up in Gusen I where he eventually died. His corpse was later hung on the fence of Gusen I by former prisoners of Gusen. In my opinion, the first photo above shows the Mauthausen main camp, not the Gusen camp, but what do I know? I previously blogged about the liberation of the Mauthausen camp here. I previously blogged about the confession of Ziereis here. The reason that I am blogging about all this again is because I have just finished reading a book entitled Atrocities at Camp Mauthausen, which you can order online here or at several other book stores. The book contains a lengthy version of the confession of Franz Ziereis, which I have not been able to find anywhere else, and a statement by Charles-Heinz Pilarski about his experience in several concentration camps before he was sent to Mauthausen. Pilarski was bitter about his imprisonment, and he was very grateful to the Americans for liberating him, so he was the perfect person to translate the alleged confession of Franz Ziereis while Ziereis was speaking. My question is “Who wrote down the alleged confession of Ziereis as he was speaking and Pilarski was translating?” Ziereis was on his death bed after he had been shot three times in the stomach while trying to escape. Yes, you read that right. Ziereis was walking backward, trying to flee, when he was shot three times in the stomach. Who said that Ziereis was shot in the stomach? Ernst Kaltenbrunner said this in his testimony at Nuremberg. I previously blogged about the testimony of Kaltenbrunner here. 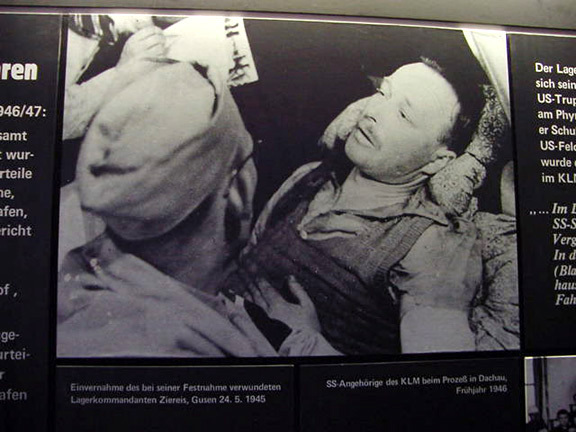 According to a sign in the Museum at the Mauthausen Memorial Site, Ziereis was shot on 23.5.1945 and he died several days later in a U.S. Field Hospital in Gusen. However, according to Hans Marsalek, who claimed to have interrogated him for 6 to 8 hours, Ziereis was shot on May 22, 1945. You can see a photo of Ziereis on his deathbed and read the sworn affidavit of Hans Marsalek, which was entered into the Nuremberg IMT, on this page of my website. When I visited the Mauthausen Memorial Site in 2003, I took photos of the gas chamber door which you can see on my website here. 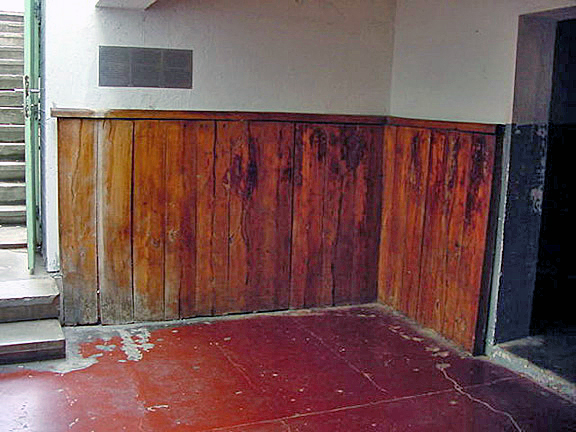 The doors of the gas chamber are not made of wood, as shown in the photo of Charles Pilaski beside the alleged gas chamber door. There are several other photos in the book Atrocities at Camp Mauthausen, which are purported to be photos taken at Mauthausen, but they are easily recognizable as photos taken at Dachau. This makes me question the alleged confession of Ziereis, as printed in the book. Did Pilarski really translate the words of Franz Ziereis as he was speaking? Who wrote down what Pilarski translated? The book Atrocities at Camp Mauthausen shows photographs of the typewritten statements of Ziereis, so someone was apparently typing as Pilarski translated. This must have been very slow. Why didn’t someone type the words in German as Ziereis spoke? Then someone could have translated it into English later. According to the book Atrocities at Camp Mauthausen, Ziereis began his confession by telling about how he was shot in the back and the bullets hit his ventral. Why didn’t Pilarski translate the word “ventral” into English? I looked this word up on Google Translate and there is no English word for ventral. The German word for stomach is Magen. I was delivered to the 131st evacuation hospital, (American) at Gusen. By the order of Reichminister Himmler, I was to kill all the prisoners by orders of the Obergruppenführer, Dr. Kaltenbrunner. The prisoners were to be crowded into a long like cave in one of the quarry walls. The opening to be walled up with large rocks. Then I was to dynamite at the entrance and blow it up. I refused these orders. This was for the prisoners of Camp Gusen I and II. Did Ziereis really say “Reichminister Himmler?” Did he really make a mistake in calling Himmler the “Reichminister” which was not his title? As the person who translated the confession from German to English, did Pilarski make a mistake in the translation? In fact, the whole translation is not very good. There must have been hundreds of people available who could have done a better translation, so why was this job given to Charles-Heinz Pilarski? The next section of the Ziereis confession is about the gas chamber at Mauthausen, which Ziereis allegedly said was built on the “secret orders” of Dr. Krebsbach. Only a person who knew nothing about the hierarchy of the Nazi government would have said something like that. Dr. Kaltenbrunner was not a medical doctor. He had a PhD in law, not a degree in medicine. Did Ziereis contradict himself in his alleged confession, or was this fake confession made up by two different people? All of a sudden, Ziereis knows the correct title for Heinrich Himmler, but Ziereis now says that the gas chamber was ordered by Glücks, not by Dr. Krebsbach, as he first claimed. The person who typed up this document, put the umlaut in the TITLES of Himmler and Glücks, but omitted it from the name of Glücks. When I visited the Mauthausen Memorial Site, a sign on the wall, near this corner, said that prisoners had to stand in front of a fake measuring device and they were shot from behind after they were fooled into thinking that their height was being measured. On the left in my color photo above is the door to the outside stairs which lead to the area between the bunker and the hospital building. To the right is the doorway to the hall leading to a door on the west wall of the gas chamber. 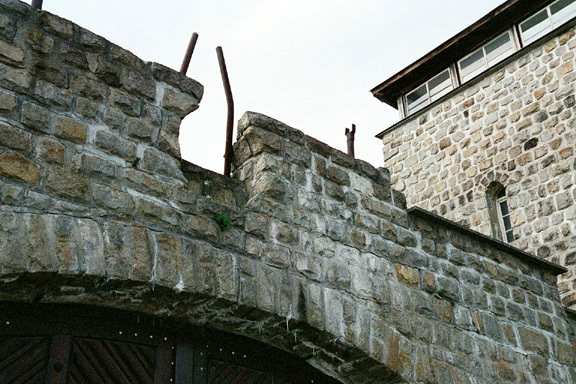 Why did the staff at Mauthausen go to great lengths to secretly execute condemned prisoners? Why not just take them to the gas chamber which was very near the spot shown in the photo above? But I digress. Back to the confession of Franz Ziereis. He had been shot three times and was dying, yet he rambled on at great length. Strangely, the questions that Ziereis was asked are not included in his confession. Did he just rattle on, without being asked any questions? The next section of the Ziereis confession, that was translated by Charles-Heinz Pilarski, was the section with the heading: “PLUNDERING JEWS AT BUCHENWALD.” Buchenwald? Yes, Ziereis had worked at Buchenwald before he was transferred to Mauthausen. So there you have it. The last dying words of Franz Ziereis: 16 million killed in four cities. I had to look up Libau. According to Wikipedia, Libau is the the German name for Liepāja. The book Atrocities at Camp Mauthausen includes the photo shown below. The caption on the photo in the book is “Slain Russian prisoners of war.” The implication is that these were Russian POWs who were killed at Mauthausen. The same photo is shown on other websites, including mine, and claimed to be SS soldiers who were shot at Dachau. No one asked me, but my personal opinion is that Franz Ziereis did not make a confession. I don’t believe that he ever regained consciousness after he was shot. I believe that Hans Marsalek and some of the other prisoners, with the help of Charles-Heinz Pilarski, wrote his confession for him. Note that his confession is all about the crimes committed by others, who might be put on trial at Nuremberg, and not about the crimes that he personally committed. He was dying and he knew that he would not be put on trial himself, so he incriminated others. What would have motivated him to do that? Kurt Becher was an SS officer who was involved in the famous “Jews for Trucks” incident near the end of World War II. When the war was over, Becher was arrested by the Allies and taken to Nuremberg, but he was not put on trial. He was a “Righteous Gentile” because he had saved Jews. Kurt Becher did not testify at Nuremberg, but he did sign an affidavit which was entered into the Nuremberg IMT. In his affidavit, Becher claimed that he had personally caused Reichsfuehrer-SS Himmler to issue an order which forbade any liquidation of Jews at Mauthausen. Himmler was dead, so he was not on trial. The affidavit was read in court because it contained accusations against Dr. Ernst Kaltenbrunner, who was on trial as a war criminal. On August 21, 1944, three SS officers (Kurt Becher, Max Grüson and Hermann Krumey) and Rudolf Kastner (a representative of the Budapest Jews) met with Saly Mayer, a leading member of the Jewish Community in Switzerland. The meeting took place in the middle of a bridge at St. Margarethen, on the border between Germany and Switzerland. Saly Mayer had refused to enter Germany and he also did not want the SS men to enter Switzerland, according to Holocaust historian Yehuda Bauer. Kurt Becher asked for farm machinery and 10,000 trucks, and in return, he promised to free 318 Hungarian Jews from Bergen-Belsen. In a show of good faith, the train with the 318 Jews was already waiting at the Swiss border. Mayer offered minerals and industry goods instead of the trucks. A second group of 1368 Hungarian Jews left the Bergen-Belsen camp on December 4, 1944 and entered Switzerland just after midnight on December 7th, according to Yehuda Bauer. Altogether, there was a total of 2,896 Jews released for ransom, including a transport of 1210 Jews from the Theresienstadt Ghetto who entered Switzerland on February 7, 1945. According to Yehuda Bauer, Becher later claimed that he had persuaded Reichsführer-SS Heinrich Himmler not to deport the Budapest Jews, and that was why Himmler issued an order to stop the deportation of the Hungarian Jews three days later. On 12 April 1946, the one hundred and sixth day of the Nuremberg IMT, the prosecutor read the affidavit of Kurt Becher, who was not in the courtroom. By this order, which becomes immediately operative, I forbid any liquidation of Jews and order that on the contrary, care should be given to weak and sick persons. I hold you (and here Kaltenbrunner and Pohl were meant) personally responsible even if this order should not be strictly adhered to by the subordinate offices. I personally took Pohl’s copy to him and left the copy for Kaltenbrunner at his office in Berlin. In my opinion Kaltenbrunner and Pohl bear the responsibility after this date for any further killings of Jewish prisoners. The most important part of Becher’s affidavit was his accusation that Dr. Ernst Kaltenbrunner had ordered 1,000 prisoners per day at the Mauthausen camp to be killed, even after Himmler had ordered that no more prisoners should be killed at Mauthausen. Becher claimed that Mauthausen Commandant Franz Ziereis had personally told him, while he was on a visit to the camp, that Kaltenbrunner had given the order to continue killing prisoners. A. In part it is correct and in part it is not. I shall explain it sentence by sentence. Q. No. Suppose you simply tell us what you claim to be false, because we must get on with this. A. I quite believe that you want to save time, but this is a question of establishing my guilt or my innocence and to do that I must be given an opportunity to make a statement in detail. Otherwise neither you nor the Tribunal would know the truth, And that is what we want here, isn’t it? I am glad that this witness Becher was found and that this statement is available, because it proves, firstly, that in September or October, 1944, Himmler was forced to issue this order, that same Himmler, about whom it has been established that since 1939 or 1940 he has committed the crime of killing Jews on the largest scale. And now we must find out why in September or October Himmler had given such an order. Before I had seen this document I stated yesterday and today that this order was issued by Hitler through my intervention, and obviously this order from Himmler is based on another order which he received from Hitler. Secondly, it is clear to me that Himmler gave such an order to Pohl as the person responsible for the concentration camps in which Jews were kept and that he gave the information to me as the person who had opposed him in this case. Where Becher is concerned, I should like to go into the question a little further. Through this man Becher, Himmler committed some of the worst possible crimes, crimes which have been exposed here. Through Becher and the Joint Committee in Hungary and Switzerland he released Jews in exchange, first, for war equipment, then, secondly, for raw material and thirdly, for foreign currency. 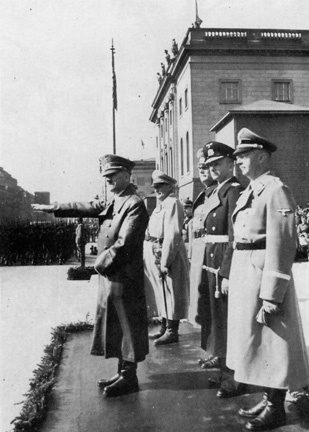 I heard about this through the Intelligence Service and immediately attempted to stop it – not through Himmler, because there I would have failed, but through Hitler; – at the moment any personal credit Himmler might still have had with Hitler was at an end – for this action might have damaged the reputation of the Reich abroad in the most serious manner. This order was an attempt to camouflage the matter and to get out of the whole thing by pretending that the responsibility rested on Kaltenbrunner and Pohl. According to this document the responsibility rested on Himmler and Pohl, but, Kaltenbrunner had to be included and be told about it because otherwise he might bring the subject up with Hitler any day. That was the intention of the document. This witness Becher is now in Nuremberg. Will you allow me to confront him here? I am quite able to prove to the world with the help of this witness that, starting with the transfer of the so-called Weiss AG. in Hungary up to that day, Himmler, Pohl and Becher, and the two committees in Hungary and Switzerland, were running this business. And I can prove how I fought against it. There is yet another accusation in this document, that on 27th April I am supposed to have given a strictly secret order to Ziereis that a thousand Jews had to be destroyed in Mauthausen every day. I ask you to have the witness Hoettl, who is also held here, called in immediately, so that I may ask him on what day I dictated and sent by courier to Mauthausen the order that the entire camp, with all its inmates, be surrendered to the enemy. The witness will then confirm to you that this order was given several days before 27th April and that I could not have given orders to the contrary on the 27th. In spite of Kaltenbrunner’s testimony which proved his innocence, he was convicted and hanged as a war criminal. I’m sitting here waiting for UPS to deliver a book that I ordered last week, searching the Internet for something of interest to read. I came across a blog post on the Oxford University Press blog here which tells about a new book, written by Mary Fulbrook, entitled A Small Town Near Auschwitz, Ordinary Nazis and the Holocaust. How should we remember these events of seventy years ago? Should there be a plaque at the Bedzin bus terminus, or the railway station, to the deportation of tens of thousands of victims of Nazism or should today’s inhabitants be able to live undisturbed by the ghettos of the past, untroubled by the murder of half of the former residents of their town? Rutka died in Auschwitz just a few months later. I had to look up the term “electric pylon.” I learned that it is a transmission tower. If that tower is still there, the memorial to the Jews who were sent from Bedzin to Auschwitz should be put up at the tower. It should be a statue of a German soldier bashing a baby’s brains out. The bashing of babies’ heads was so common during the Holocaust that virtually every survivor has included a story about it in his or her memoir. Yet, as far as I know, there is no memorial in honor of all those babies. I previously blogged about the bashing of babies here and here. I wrote about a story told by Holocaust survivor Philip Riteman, regarding the bashing of a baby, near the end of this page of my website. But the book is much more than a portrayal of an individual man. Udo Klausa’s case is so important because it is in many ways so typical. Behind Klausa’s story is the larger story of how countless local functionaries across the Third Reich facilitated the murderous plans of a relatively small number among the Nazi elite – and of how those plans could never have been realized, on the same scale, without the diligent cooperation of these generally very ordinary administrators. As Fulbrook shows, men like Klausa ‘knew’ and yet mostly suppressed this knowledge, performing their day jobs without apparent recognition of their own role in the system, or any sense of personal wrongdoing or remorse – either before or after 1945. This account is no ordinary historical reconstruction. For Fulbrook did not discover Udo Klausa amongst the archives. She has known the Klausa family all her life. She had no inkling of her subject’s true role in the Third Reich until a few years ago, a discovery that led directly to this inescapably personal professional history. This makes me wonder about the minor officials in America who rounded up the German-Americans and sent them to internment camps for the duration of the war and for two years after the war. Has anyone ever done a book on them?